Our objective of study is promoting lifetime productivity with increasing the health of cows and developing the labor-saving system in dairy cattle management. We are carrying out following research to achieve our goal. (1) more effective breeding techniques in dairy cattle, (2) the amount of nutrients required for dairy cows, (3) endocrine and metabolic systems for milk production, (4) indicator of the health of dairy cows. Milk production increases rapidly during the first two months after parturition, and then gradually decrease. Large increase of milk production in the first two months cause several disease of dairy cows. It causes decrease in economic efficiency of dairy farms,if milk production decreases rapidly. Therefore, it is necessary to study about improving the ability of dairy cows with gradual increase in the milk production immediately after parturition and long-term sustained high milk production. The development of management technology in dairy cattle to improve their health. 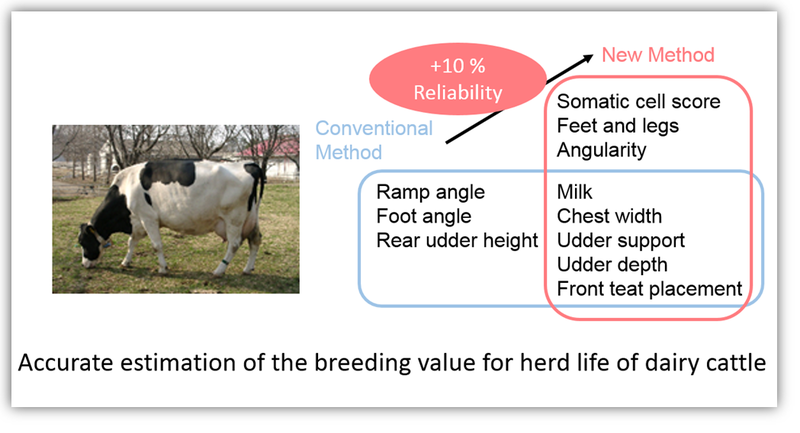 We have been studying about the dairy cattle management to reduce their disease from pre- to post- parturition (perinatal). This enhances the lifetime productivity and labor saving management of dairy cattle.